During the second of his ten terms as mayor of New York City, Clinton signs his copy of the ordinances for governing the city at the top of the title page. DEWITT CLINTON. Signed Book. 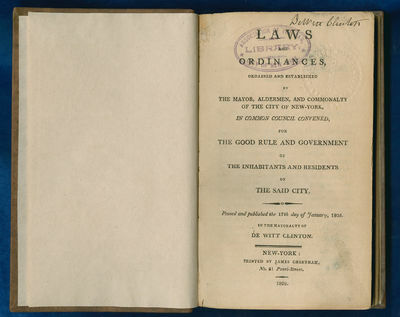 Laws and Ordinances, Ordained and Established by the Mayor, Aldermen, and Commonalty of the City of New-York, in Common Council Convened, for the Good Rule and Government of the Inhabitants and Residents of the Said City. Passed and published the 17th day of January, 1805. In the Mayoralty of DeWitt Clinton. First Edition. New York: James Cheetham, 1805. DeWitt Clinton's ownership signature on title page. 160 pp., 7¾ x 4½ in. On January 17, 1805, the Common Council of the City of New York met. Those present included Mayor DeWitt Clinton, six of the city's nine aldermen (Philip Brasher, Mangle Minthorne, James Fairlie, James Drake, Abraham King, and Jacob De La Montagnie), and eight of the city's nine assistants (Samuel M. Hopkins, Andrew Morris, George J. Warner, Simon Van Antwerp, Abraham Bloodgood, Jacob Mott, Clarkson Crolius, and Joseph Board). Each of the city's nine wards had an alderman and an assistant, and each ward was represented by one or both at this meeting. During the meeting, the Common Council "proceeded to a consideration of the ordinances," and passed ten laws. Topics included "due observance of the Lords day, called Sunday"; "the establishment of a Board of Health" with a city inspector; "procuring regular Bills of Mortality" and "a Register of Births and Marriages"; regulating taverns, "victualling houses," and boarding houses; directing month reports of measures of grain, lime, charcoal, boards, and timber and "Weighers of Hay" with annual reports; better regulation of the alms house; the appointment of a street commissioner; the appointment of a "Superintendent of Scavengers," charged with providing for sweeping the streets and preventing nuisances (public sanitation); the appointment of a comptroller; and preventing and extinguishing fires. newspaper from 1801 until his death. Cheetham's libelous accusations against former vice president Aaron Burr helped ensure Burr's overwhelming loss in the April 1804 New York governor's race, even after Burr started the Morning Chronicle, whose editor Peter Irving counterattacked Cheetham. These attacks by fellow Democratic-Republicans may have played a role in Burr's challenging Federalist Alexander Hamilton to a duel in July 1804. DeWitt Clinton (1769-1828) was born in New York and attended the College of New Jersey before graduating from King's College (Columbia University) in 1786. His uncle George Clinton was the first governor of New York from 1777 to 1795 and again from 1801 to 1804, and served as vice president of the United States from 1805 to 1812. DeWitt Clinton was admitted to the bar in 1790 but became secretary to his uncle. The younger Clinton served in the New York State Assembly in 1798 and in the New York Senate from 1798 to 1802 and again from 1806 to 1811. He completed the term of a resigned member of the U.S. Senate from 1802 to 1803, but resigned over living conditions in Washington. Appointed mayor of New York City, Clinton served a total of ten non-successive terms from 1803 to 1807, from 1808 to 1810, and from 1811 to 1815. He also won election as lieutenant governor of New York and served from 1811 to 1813. After his uncle unsuccessfully challenged James Madison for the Presidency in 1808, the Federalists turned to DeWitt Clinton in 1812. Although he polled stronger than many Federalist candidates, he lost to Madison in the Electoral College by a vote of 128 to 89. When Governor Daniel D. Tompkins resigned as governor of New York to become vice president of the United States in 1817, Clinton won a special election to succeed him. He won reelection over Tompkins in 1820. As governor, Clinton presided over the building of the Erie Canal and continued in that role after he left office at the end of 1822. When political opponents removed him as President of the Erie Canal Commission in April 1824, the political backlash led to his reelection as governor later that year, and he again served from the beginning of 1825 until his death.